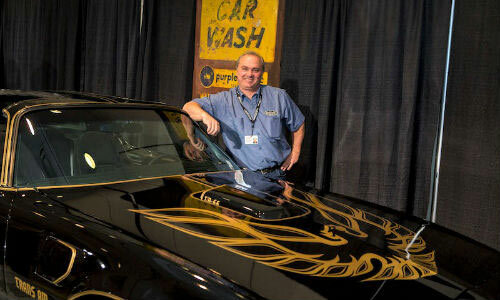 John Antoniadis and his Smokey and the Bandit inspired Pontiac Trans Am won the $5,000 grand prize at the Canadian International AutoShow’s Muscle Car Matchup. The event being a partnership between AutoShow and Legendary Motor Cars. He may have been seen as the underdog at the event, not being a professional or having his own workshop, but the results speak for themselves. The car itself, which is a 1977 Pontiac Trans Am was purchased as a barn find after sitting for decades 10 years ago. 95% of the work was done by John which is a faithful recreation of the original “Blocker” as used in the Smokey and The Bandit movies. The car beats over 80 other vehicles to win the top prize. It features a 6.6 L big block engine with a four speed manual transmission and rare w72 code high performance package. the cars are fully matching numbers powertrain with an original 8 track recorder, 3.23 Posi-Traction Rear and is a y-82 designation code special edition with unique paint and interior.